To change widgets visit the Appearance > Widgets screen in your dashboard or the widget area in the Customizer. Why are there widgets on my blog that aren’t listed in Appearance > Widgets? Why are some of my widgets not loading? Watch the following video to learn more about widgets. Student engagement – Quiz widgets, Pet widgets, Wonderopolis. Information to help other classes learn more about your class – date widgets, date/time widgets, weather widget. We’ve set up Widget demo blog to showcase the most popular widgets that educators, and students, like to add to their sidebar so you can check out all the widgets in one handy location. Each widget has configuration options. To make changes to a widget click on the triangle on the right side of the widget. Each widget has different configuration options. Below is an example of the category widget. After you’ve configured the widget click Save. 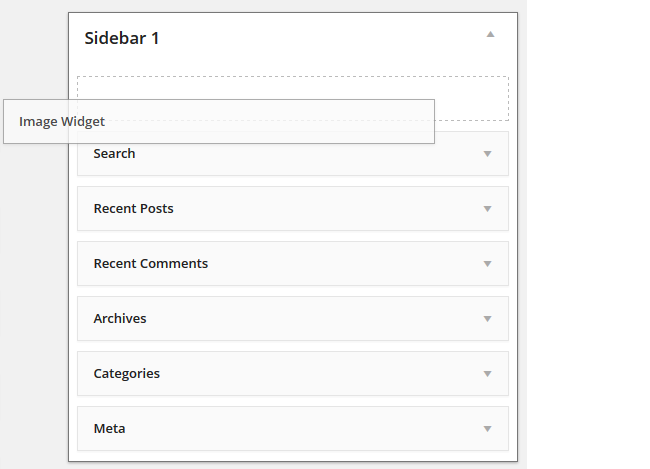 You can easily hide or show widgets on certain pages using the Widget Visibility module in the Jetpack by WordPress.com plugin. Refer to the Widget Visibility support page for more information. Some themes will display default widgets if you haven’t added any widgets to your sidebar and you won’t see these default widgets list in the sidebar. Add any widget to the sidebar automatically removes the default widgets replacing them with the new widget. Add an empty text widget if you want to remove the default widgets and don’t want any widgets to show in the sidebar. A few themes have widgets hard coded into the theme. For example. Pages, Recent Posts, Categories, “What is this Place”, Friends & Links on the theme NotePad Chaos are widgets that have been hard coded in the theme. These widgets can’t be removed. If you don’t like these widgets you need to change to a new theme. Contact Edublogs support if you need help.